We have selected three of the most exquisite salts in the world for this delectable three-pack set. Pass these convenient stackables around the table or take them on the go! Includes one stackable each of Pink Himalayan Salt, Italian Black Truffle Sea Salt, and Lemon Rosemary Sea Salt. Use these crisp, flavorful salts to add a unique twist of flavor anywhere that you would use typical table salt! 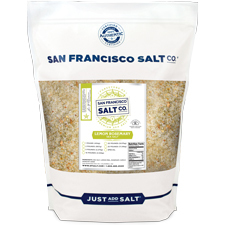 PACIFIC OCEAN SEA SALT - Integrate one of the most esteemed delicacies in the culinary world into your finest entrees with our Italian Black Truffle Salt. 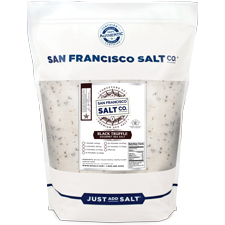 European Mediterranean�Sea Salt is enhanced with black truffles from the Abruzzi region of Italy to add savory, gourmet wonder to your dishes.�The crisp flavor of sea salt perfectly complements the distinctive and smooth flavor of black truffle. This salt is sure to leave you wanting more! LEMON ROSEMARY SEA SALT�-�This Sea Salt blend offers the perfect balance between zesty lemon and savory rosemary and garlic. This is an incredibly distinctive and addictive salt that is sure to leave a lasting impression on your pallet. ORIGIN - The Himalayas, USA, France, and Italy. 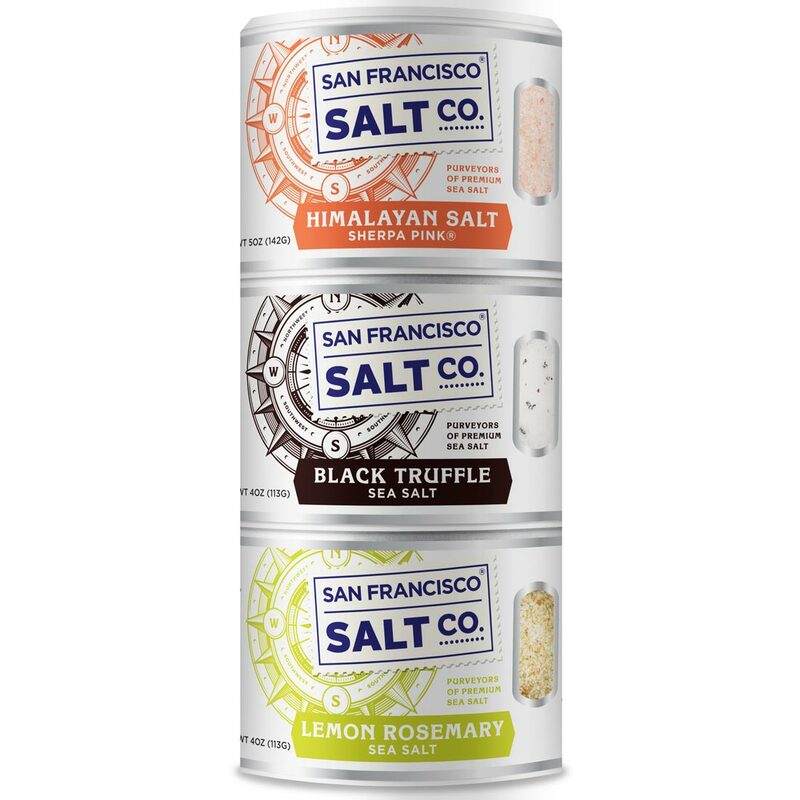 DESCRIPTION - One stackable shaker of each of these popular and highly versatile salts: Sherpa Pink� Himalayan Salt, Italian Black Truffle Sea Salt,�and Lemon Rosemary Sea Salt. PROPERTIES - Our 100% natural Sherpa Pink� Himalayan Salt, Italian Black Truffle, and Lemon Rosemary Sea Salt are all�Kosher Certified, Non-GMO, and do�not contain any MSG, Soy, Gluten, Dairy, anti-caking agents, artificial colors, or additives.�We import only the highest quality food-grade salts straight from the source and package them in our U.S.A., GMP certified packaging facility, which is 3rd party audited by SCS Global. 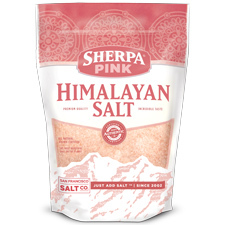 NET WEIGHT -�Sherpa Pink� Himalayan Salt 5 oz. ; Black Truffle Sea Salt 4 oz. ;��Lemon Rosemary 4 oz. INGREDIENTS - Natural Himalayan Salt; Mediterranean Sea Salt, Italian Truffle, Truffle Flavor; Pacific Ocean Sea Salt, Lemon Peel, Rosemary, and Garlic. 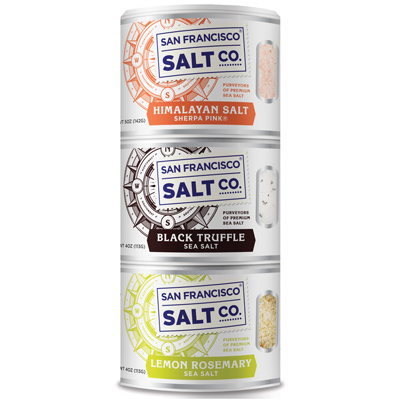 GRAIN SIZE - Sherpa Pink� Himalayan Salt: Extra-Fine; Black Truffle�Salt: Fine;�Lemon Rosemary Salt: Fine.